An injured Palestinian mother and child were brought into a Jerusalem hospital as a result of a deadly car crash. Due to the severe injuries of the mother, she was unable to feed her baby, so one of the nurses on staff took it upon herself to breastfeed the infant. Yamen’s aunts arrived at the hospital and tried to feed the 9-month-old with a bottle, but he would not take it, and they were forced to sit and watch for seven hours as he cried in hunger. That is, until Ola Ostrowski-Zak arrived for work that night. The Israeli nurse said she immediately knew she had to do something. “I thought to myself, ‘I must help this baby,” she told The Today Show. 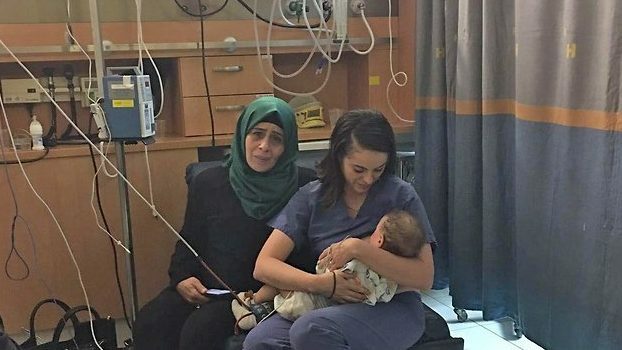 No Comments on "Israeli Nurse Breastfeeds Baby of Injured Palestinian Woman"